When you look at this gloss in the tube, you may expect it to be an opaque, bold gloss. However, I found the the Burt's Bees Lip Gloss to have a sheer finish. I did try to build it, but I found that it can become patchy if you try to apply more and then it doesn't look as good. It does have a nice, subtle hint of colour though which looks really natural and it isn't sticky on the lips at all. It has a wear time of around 2hrs before it needs a top up and it isn't drying on the lips. Instead, it leaves them feeling soft and smooth after removal. These glosses are fab for casual daytime wear, and I think that the names are really well suited to them (well definitely for the two that I have, for sure!). Spring Splendor is a happy, subtle spring type of shade and Evening Glow is certainly something that I can see myself reaching for in the summer evenings. Another plus with these glosses is that they don't leave behind a huge amount of shimmer after removal. The downside of the collection as a whole to me though is purely speculative. I haven't tried all of the shades, but a few of them do look rather similar in the photos. As they apply sheerly, I'm not 100% as to whether they would look the same when on the lips. This isn't the biggest problem though as if two shades are similar you probably won't need to buy them both (but if you are anything like me then maybe you still would! ), and I could be totally wrong, but I do really like them all the same. If you are looking for a natural, sheer, non-sticky gloss that leaves the lips feeling smooth and soft, then these are worth checking out. I already have my eye on a couple of the other shades in the collection! You can purchase the Burt's Bees Lip Glosses for £8.99/6ml from Burt's Bees. 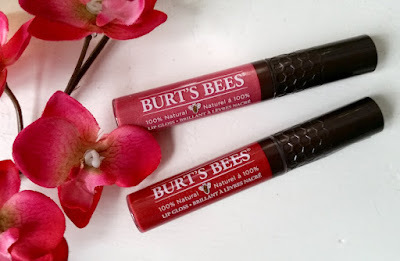 What are your thoughts on the Burt's Bees Lip Glosses? Which is your favourite shade?